DOWNLOAD LATITUDE, LONGITUDE FILES FOR SWIMMING HOLES IN THIS STATE (not yet available for all states). Read this explanation first. 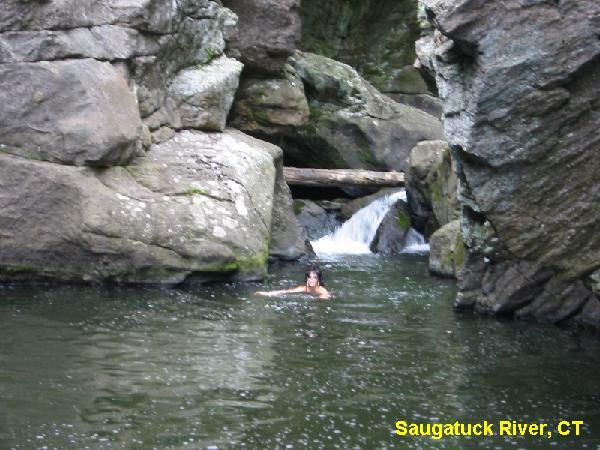 Two swimming places in Natchaug River. Diana's Pool is popular with the students at the University of Connecticut. DIANA'S POOL [DIAN]: The pool is very easy to find. From the intersection of Routes 6 and 198 in Chaplin, follow Route 198 north for 0.5 miles. Just past the Chaplin Fire house, turn right onto Diana's Pool road. There is a small parking lot immediately on the left, enough for 6 or 7 cars. Park here and follow the trail upstream. You will pass a few deep pools before you reach the main pool. 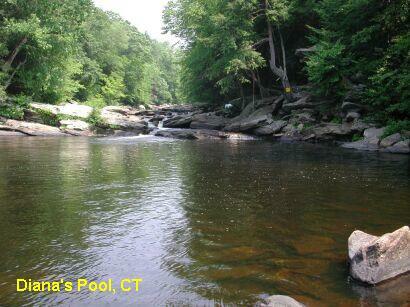 Diana's Pool is very large and has a beautiful 'S' shaped, triple tiered waterfall PHOTO 1. Officially, there is no swimming at the pool PHOTO 2, and this rule is enforced at times. It is a very popular place, especially with students from the nearby University of Connecticut. 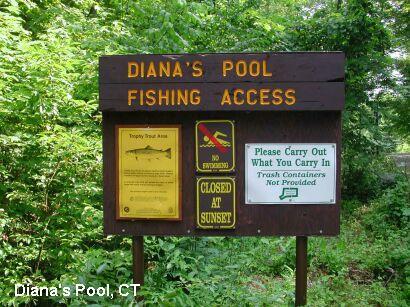 CAUTION ' People have died and have been seriously injured by jumping into Diana's Pool from the rock outcroppings. Also, the rope swing has an awkward takeoff and the landing area is very close to the rocks on the edge of the water. Resist the temptation to use it. I watched one person swing on it and decided that it was too dangerous. ENGLAND'S BRIDGE [ENGL]: There is another area, upstream of Diana's Pool that may be called England's Bridge. The west bank of the river has what looks to be a wall made of large stones, which may have been the old bridge abutment. This area has huge boulders in the stream, perfect for sunning yourself. 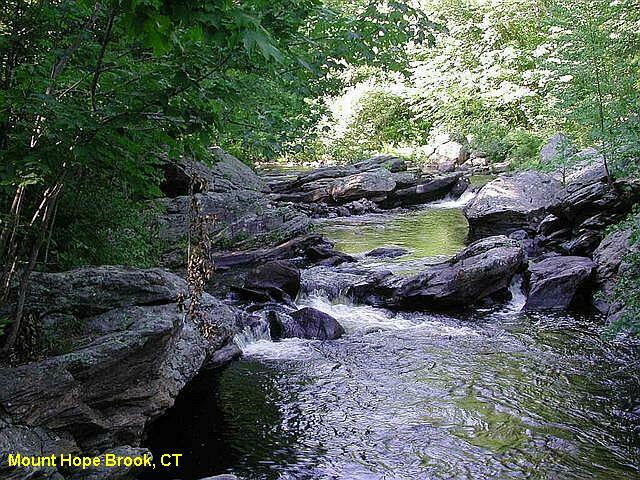 A fast running brook with a sandy bottom and rocky sides. Fresh clear water. CAUTION - Do not jump off high rocks here, it is very dangerous and there have been fatalities. This area is intended for Glastonbury residents only; police are enforcing this rule. A meandering stream that has carved out a nice hole in a bend in the Weekeepeemee river. 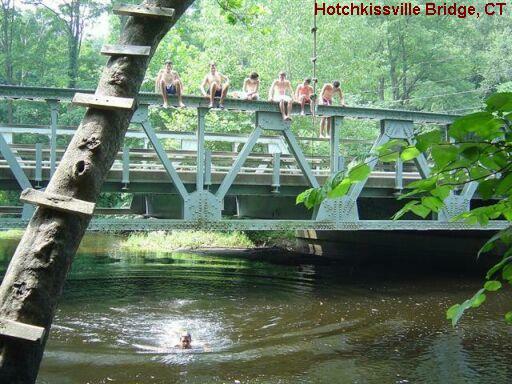 Not exceptionally deep, but deep enough in the center of the pool to jump from the bridge and ride the sturdy rope swing. Several trees are fitted with ladder steps to accommodate your airtime needs. CAUTION - Check the depth of the pool before you jump in; watch the locals jump first to get an idea of the landing area. 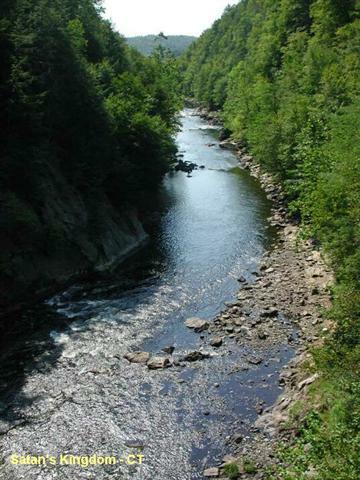 The Weekeepeemee is a small stream and water levels can vary greatly. This is a popular teenager hangout, not suitable for small children. From the intersection of RT 6 and RT 47 in Woodbury, follow RT 47 north toward the borough of Hotchkissville. Just past the RT 132 intersection which forks to the right, stay on RT 47 and cross over an iron bridge. You can park on the right just after the bridge. There is a somewhat larger parking area a bit further down RT 47 on the left. 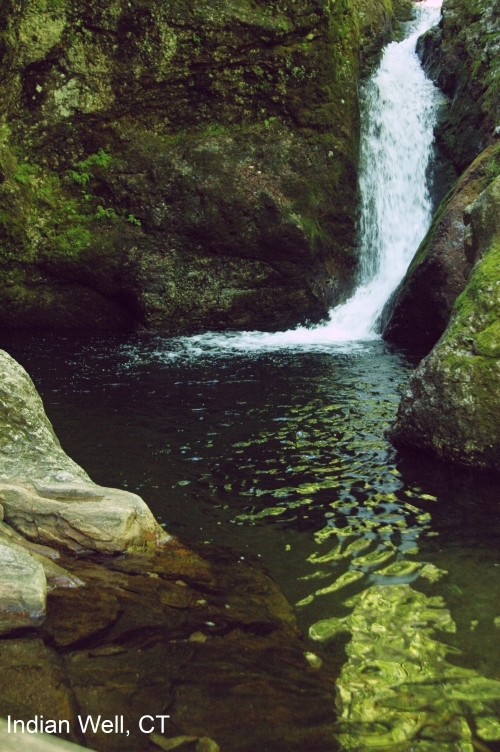 Scenic waterfall in creek with swimming in a deep, small pool at the bottom dammed up with rocks (photo above). Also official swimming beach on river with lifeguard and facilities (no photo). Note that some readers have reported that the police will occasionally patrol this swimming hole and may issue fines. Unofficial at falls, official at river beach. Free at falls, $5.00 per car at river beach. Unknown at falls, required at river beach. From New Haven, take RT 34 west to toward Shelton. Just past the underpass for RT 8, take a left onto Bridge Street; you will cross the river at this point. Take a right onto Howe Ave, this is RT 110 North. Follow RT 110 north about 2 miles and follow signs to Indian Well State Park. Just before you enter the State Park, see a sign on the left for the trail to the falls, and a parking area on the right. Park here and take a very short hike to the falls and the pool below. There are signs here that say "no swimming". The State Park beach on the river is just a bit further on this road. Swimming in an unsupervised, bucolic area of a very large, clearwater lake. Though state parks are not usually included on our website, this spot is particularly beautiful and unique. 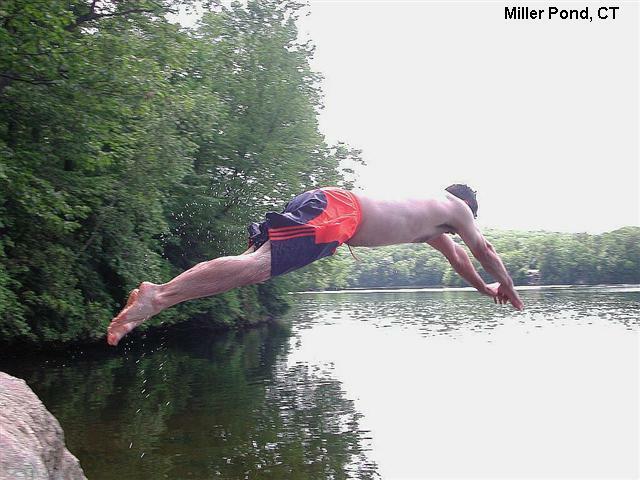 The portion of Bigelow Hollow State Park on the southern shore of Lake Mashapaug is dotted with picnic areas, small islands and rock formations inviting swimmers. A short walk through the woods leads to the largest rock outcropping PHOTO 1 which is great for sun bathing and taking in the view of the entire lake. A submerged rock formation PHOTO 2 just offshore is an easy swim and begs for exploration. To the right of the large rock, is a sizeable shallow, sandy area PHOTO 3 that is perfect for those who are more comfortable with wading. Get here early to claim your picnic spot. The CT DEP charges a nominal fee to enter the park. Follow interstate 84 to Exit 73 then follow RT 190 north. Take a right on RT 171 East to the park entrance. on your left. Once in the park, follow the park road past Bigelow Pond on your left (a sizeable pond itself) to the boat launch for lake Mashapaug. Park here and follow the obvious train along the shoreline. Follow the signs for "Rock Island" PHOTO 4. It's about a 15 minute walk to the large rock.. Swimming in a very large pond or more accurately a small lake. There are several small beaches and low angle sloping rock outcrops along the perimeter of the lake, some with picnic tables. This is a beautiful, deep lake that is very popular in the summer; the small parking lot fills up quickly on the weekends. Because there are so many small access points scattered around the lake, the area can accommodate many people but you can have your own little swimming area that is relatively private. When you arrive at the lake, just follow the well worn path that follows the shoreline and find yourself a place to call your own. This is an excellent place to stop in at the end of the day for a refreshing swim. 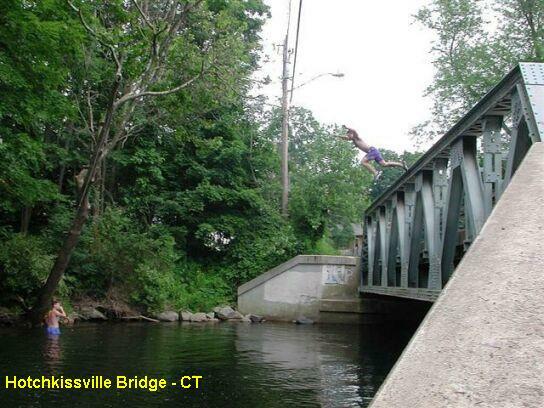 The State of Connecticut DEP now prohibits jumping from the cliffs on the west side of the pond. Beginning in 2007, DEP officers will issue a fine of $75 to anyone who jumps or dives from the western cliffs or uses the rope swing. From Middletown, follow RT 17 South into Durham. Just past the intersection with RT 147, turn left onto Haddam Quarter Road. This road is very hilly and curvy, so be careful. Go straight at the first 4-way intersection then take a right at the second 4-way intersection onto Foothills Rd. The fenced parking lot will be on your right; do not park on the road. During the peak summer months, the parking lot fills up quickly on the weekend and you may see cars parked on along the roadside; if the lot is full when you visit, plan to return at another time. If you arrive before 10:00 AM, you should have no problem finding a space. If you visit during the week, you just might have this entire, beautiful lake all to yourself! Fast running brook with wide and flat area upstream, good for wading and small children. 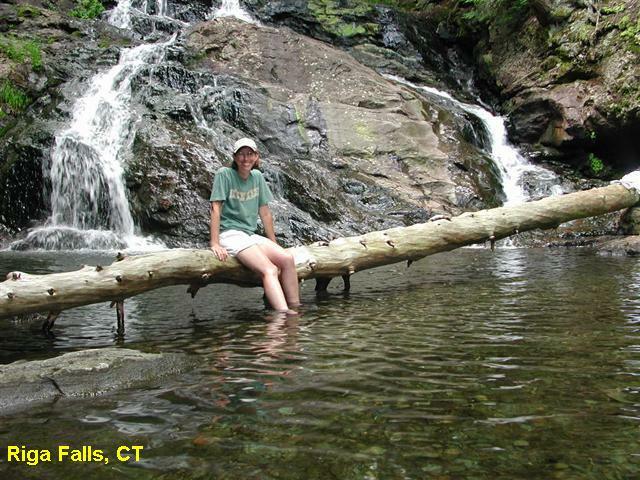 Further downstream there are many small falls, Jacuzzis and whirlpools with scattered boulders. Downstream from the small falls, there is one deep pool (5' - 6' deep during low water) where you can actually swim just before the brook crosses under the Atwoodville bridge. The brook is in the sun for most of the day so it's nice and warm. There are many large boulders for sunbathing on both the east and west banks. You can spend all day in the water! No camping at site; camp at Mashamoquet Brook State Park northeast of here. From Hartford, take RT 6 east about 30 miles to Willimantic. In Willimantic, take RT 195 north to Mansfield Center. In Mansfield Center, take RT 89 north about 3 miles then turn right (east) onto Atwoodville Lane. Atwood Lane very shortly crosses a bridge, the swimming hole is here. There is NO PARKING near the bridge just above the creek. However you can park on Elizabeth Road or Hickory Lane about 0.2 miles further east off of Atwoodville Lane. The creek is very near private property and the owners do not like people parking on their land (understandably). 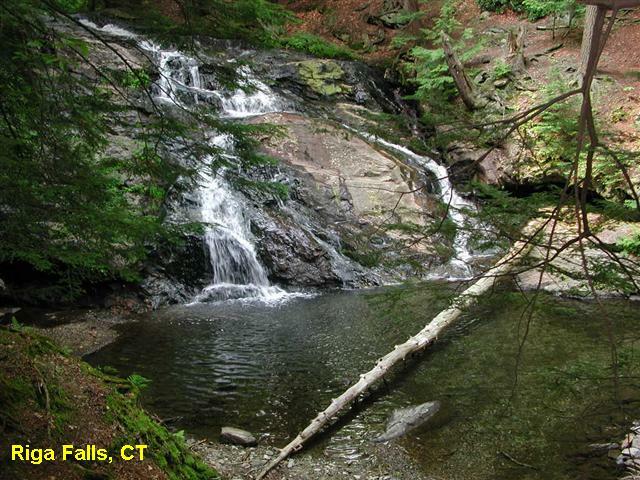 Small pool at the bottom of a very steep ravine in the Riga Falls Preserve. Very remote and popular. 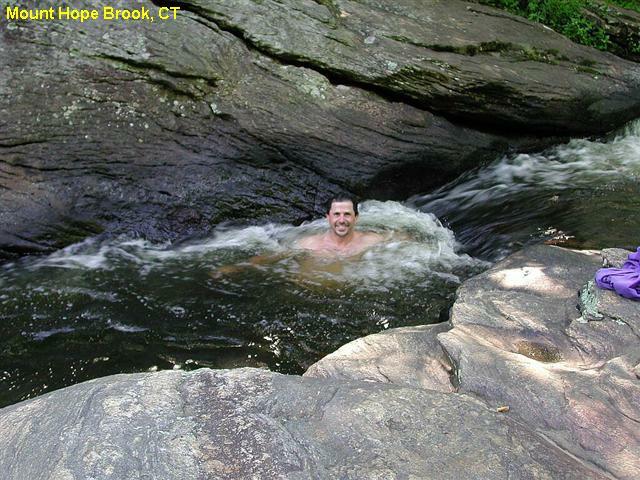 The pool is not very deep, but this is a very nice place to cool off after hiking up and down Bear Mountain. The rocks around the falls are very slippery. Do not attempt to climb up or walk above the falls. From the intersection of RT44 and 41 in Salisbury, follow RT 44 west into the center of town. Just past the large white town hall building, take a right on Washnee/Factory St. (This street apparently has two names. I've been there and seen the street sign and still can't quite figure it out.) Follow the signs for Mount Riga. At 0.7 miles, bear right and continue to follow the Mount Riga signs. At 1.2 miles, this paved road turns into a dirt road. 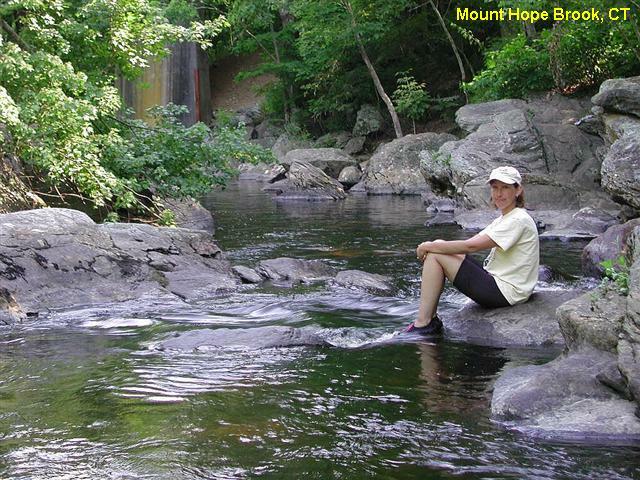 At 1.5 miles, cross a small bridge into the Mount Riga Preserve. Follow this narrow, windy dirt road being alert for oncoming cars. At 2.9 miles there will be a pullout/parking area on the right. Park here and carefully descend the steep trail down to the water. 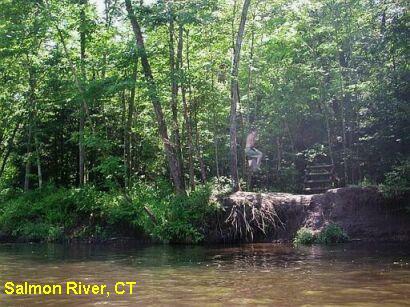 In the Salmon River State Forest there are several places to swim in the Salmon River and tributaries. For details, see "DIRECTIONS" below. From Enfield, follow RT 190 east towards Hazardville. At the intersection with RT 192 turn right onto South Maple Street. Follow South Maple Street for approximately 0.4 miles to a metal bridge. Cross the bridge and park in the pullout on the left. There is room here for several cars. You can't miss it. 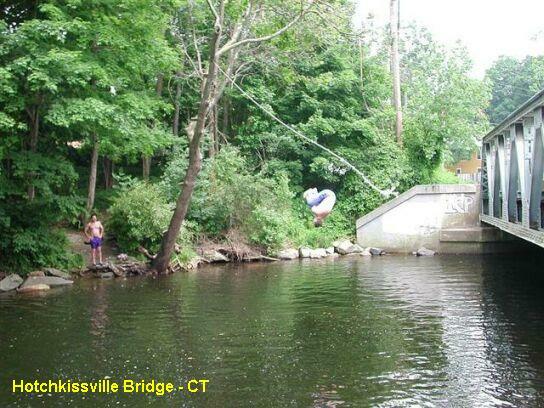 Popular tubing run in the Farmington River. Class I, II, III whitewater rapids on a scenic stretch of river suitable for inner tubing (with life jacket). Tube through Satan's Kingdom Gorge, a steep drop into a narrow gorge. You will tube through some calm, wide sections of the river where you can swim. Put-in at Satan's Kingdom State Recreation Area, RT 44, near New Hartford. Take Out just before the RT 202 bridge in Canton. About 2.5 miles or 2-2.5 hours. There is a commercial tubing outfitter there or you could use your own tubes and life jackets. The river runs parallel to RT 44 into Canton. You could leave a bicycle or car in Canton and ride back up RT 44 to get your car after tubing. The business charges for tube and life jacket rental and a bus ride back. Follow this link for more information: http://www.farmingtonrivertubing.com/ Those who want to save a buck can bring their own tubes and life jackets and just hop in the river. Be advised there could be police/conservation officers who will require you to wear a life jacket. At the end of the commercial tube run, there is a small parking area where you can leave your car or bicycle and drive back to the Satan's Kingdom park. Most people choose to just pay the rental fees because you don't need to coordinate anything, and don't need two cars. $18-$20 if you rent tubes, otherwise free. From Hartford, take RT 44 west about 20 miles to New Hartford. 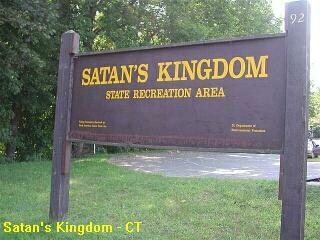 The Satan's Kingdom State Recreation Area is there on RT 44. The commercial tube rental outfit is in the park. A visitor writes "About two hundred yards further down the road, the river on the right will suddenly disappear into a canyon at which point there is a pool, waterfalls, and rocks to jump from. It is in an unmarked park. The depth of the pool (11-25? 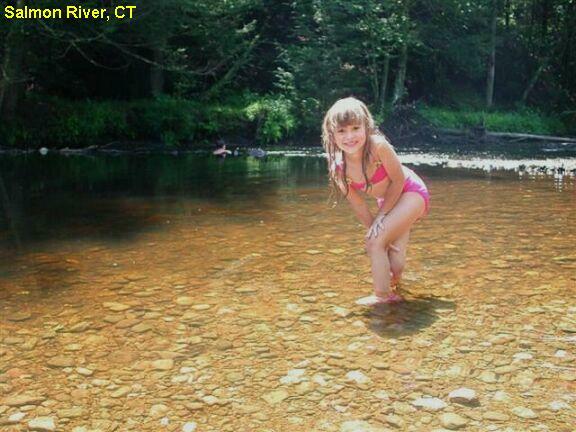 feet) varies substantially due to level of the river and the uneven riverbed. The water can be shockingly cold, even in the summertime as it comes from the bottom of the reservoir. All in all, it is a great place to go swimming on a very hot summer day or for a quick stop for some nice scenery if in the area. Highly Recommended." Note that some readers have reported that the police will occasionally patrol this swimming hole and may issue fines. Take the Merritt Parkway to exit 42. Follow RT 57 north. At approximately 1 mile, take a right onto Lyons Plains Rd. Almost immediately, you will come to a "Y" intersection, bear left to remain on Lyons Plains Rd. After approximately 2 miles you will bear left at the "Y" intersection onto Valley Forge Rd. In about 1.5 miles, you will reach a small bridge over the Saugatuck River. At this point the Saugatuck River emerges from the bottom of the dam. Parking is not available at the bridge. There is parking on the right side of the road before AFTER the hole immediately before the dam.